Yellow Bracted Lousewort blooms from the skeleton of a pine tree below Notchtop Mountain in Rocky Mountain National Park. 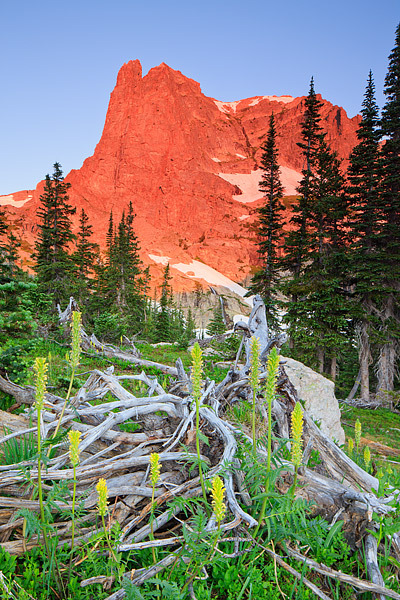 Notchtop is illuminated in a fiery red as the first light of the day illuminates the peak above the blooming wildflowers below. Grace Falls can be seen flowing at a good clip from the mid section of Notchtop Mountain. There are few more enjoyable experiences than a backcountry summertime sunrise in Rocky Mountain National Park. Photo © copyright by Thomas Mangan.